Follow this easy step-by-step paper flower wreath tutorial to recycle waste paper from your craft supplies. 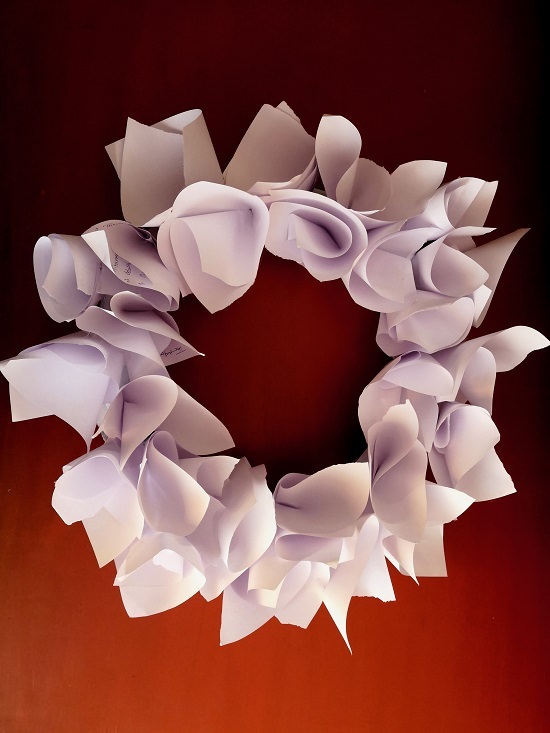 This how to make a paper wreath tutorial is simple to understand and a great project to shoot up your 2019 DIY spirit! Select a thick corrugated fiberboard piece and cut a circle out of it. The measurements of the above piece are 6 cm to the outer circle and 3 cm to the inner round. You might face trouble cutting the perfect circle just as we did, don’t worry it’s fine with the imperfections as well. Place the back side of the wreath base onto a black colored paper, cut it and paste it to the base. Make sure that the paper you use is thick enough to add a layer of protection to the board. This step is optional, but if you wish to hide the cardboard base of your wreath, you can paint it with some acrylic paint. You can use the spray paint as well, be sure to protect your working area with a cloth or waste paper to not mess it with paint. Tear an A4 size sheet roughly into half and fold it into a cone. To explain it better- press the sheet from the middle and fold it in a cone shape. Once you get a cone, fold the bottom a bit. Glue the folded part of the cone to the wreath base using hot glue or any other strong adhesive. Repeat step four and five until you cover the base completely with paper cones. This is how your wreath should look like once it gets completely covered with the paper cones. If in case any of the cones fall, glue it to the base and to the adjacent cone to ensure it’s sturdiness. Finish off your paper flower wreath by wrapping it with a fairy or string light. You can keep it simple with one string light or try a combination of light. 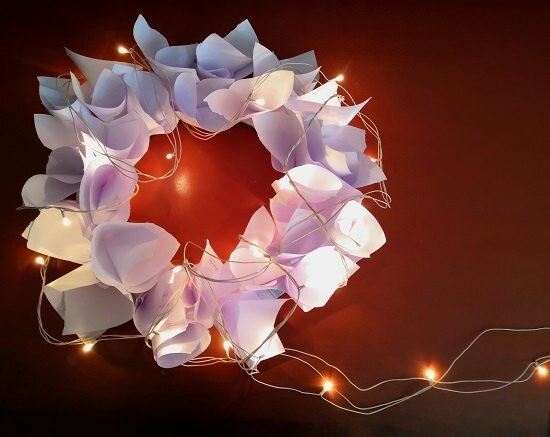 Your paper flower wreath from waste material is all ready to light up a romantic evening in your home. Hang it in a favorable place, near a dining setting or display it on your front door. It creates a charismatic surrounding without much materials being used. 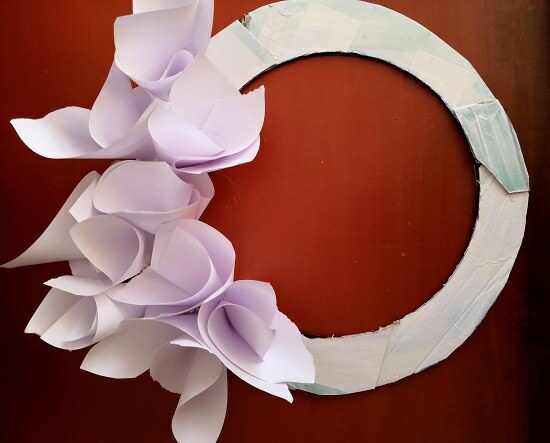 We hope that this paper flower wreath tutorial was inspiring enough to incline you more towards recycling. The more you recycle the more you contribute to making the earth better!